Over 4 billion pounds of toxic chemicals are released by industry into the environment of the United State of America each year, including 72 million pounds of recognized carcinogens, as per Scorecard, a website that collates and shares pollution information across the country. According to Occupational Safety & Health Administration (OSHA) toxic industrial chemicals are manufactured, stored, transported, and used throughout the world. Toxic industrial chemicals can be in the gas, liquid, or solid state. They can be chemical hazards (e.g., carcinogens, reproductive hazards, corrosives, or agents that affect the lungs or blood) or physical hazards (e.g., flammable, combustible, explosive, or reactive). OSHA has listed down toxic industrial chemicals, by their degree of hazard, on their website. In Australia, the National Pollutant Inventory provides information about substance emissions in Australia. It also has Substance Factsheets about polluting chemical substances and their harmful effects on health and the environment. Did you know that industrial and automotive machine parts cleaning can be done without the use of chemical solvents? No hazardous chemicals are used during the cleaning nor are any produced by the process. The Ecosafe Washer from Alsco uses the human and ecologically friendly process known as Bioremediation. Find out more about the process here or simply speak to a friendly Alsco representative. Some toxic chemicals are more commonly used and are more widespread in industry as compared to others. 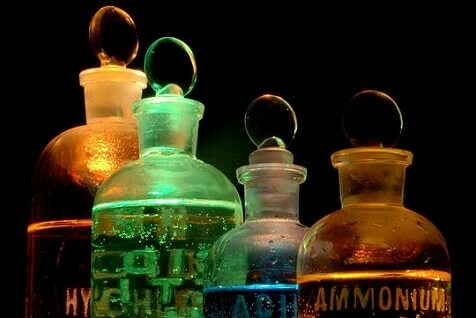 Here is a list of some of the most commonly used chemicals. Acetone is a colourless liquid with a distinctive odour and taste. It is one of the most popular solvent that has a wide range of uses as many compounds dissolve easily in it and it is also capable of mixing up nicely in water. As a result of the above, many industries use Acetone as a base for their solvents. It is extremely popular in the plastics and paint industry, as a heavy duty degreaser, to prepare metal before painting, to remove residues from glass or porcelain, to thin fibreglass resins or as a reagent in biological research. Although widely used and extremely common, Acetone is hazardous too. It is a VOC (Volatile Organic Compound) and its extreme flammability is the most common hazard associated with it. Great care should be taken to follow proper procedures while handling, storing or transporting Acetone. Acetone fumes are an irritant too. If inhaled, they may cause headaches, dizziness, short-term loss of memory and nausea. Exposure to these fumes can cause dryness and irritation of the skin. There could be tearing up and a burning sensation in the eye. It is advised to always wear goggles while handling Acetone. Acetonitrile is a used in many industries, as a solvent, for spinning fibres and in lithium batteries. It can be found in air from the exhaust of automobiles or from industrial manufacturing facilities. Short term exposure to the fumes results in irritation of the mucous membranes. However, continuous longer term breathing of contaminated air affects the central nervous system, resulting in headaches, numbness and even convulsions. Ammonia is a colourless, highly irritating gas, with a pungent, suffocating odour. It is one of the most commonly produced industrial chemicals. Most of the ammonia produced by industry is used in agriculture as a fertiliser. Ammonia is also used in the refrigeration industry as a coolant gas, and in the manufacture of plastics, explosives, pesticides, dyes and other chemicals. Solutions containing ammonia gas dissolved in water are used as industrial cleaners and are highly corrosive. The gas is flammable and can form explosive mixtures with air (16–25%). The ammonia vapour from concentrated ammonia solutions is severely irritating to the eyes. Exposure to high concentrations of ammonia in the air causes immediate burning of the nose, throat and respiratory tract. Inhalation of lower concentrations can cause coughing, and nose and throat irritation. Ammonia solutions should only be handled in a fume hood. To know more, read the Occupational Health and Safety Guidelines on Ammonia here. Benzene is a highly flammable liquid, which occurs naturally in crude oil, natural gas and some ground waters. It is also present in crude oil vapours. It evaporates into the air very quickly and dissolves slightly in water. Workers in oil refineries, the petrochemical industries, foundries (where benzene sulphonic catalysts are used) or those involved in the storage, distribution and use of benzene or petrol might be exposed to benzene during their work. The short term breathing of high levels of benzene can result in death, while low levels can cause drowsiness, dizziness, rapid heart rate, headaches, tremors, confusion, and unconsciousness. Eating or drinking foods containing high levels of benzene can cause vomiting, irritation of the stomach, dizziness, sleepiness, convulsions, and death. It is also carcinogenic. Long-term exposure to excessive levels of benzene in the air causes bone marrow suppression leading to serious blood disorders such as anaemia or cancer – forms of leukaemia and other white-blood-cell cancers. Click on this link to read more about Working with Benzene while taking care of health and safety of the people working with it. For more on public health and Benzene, read this WHO publication. Chloroform is primarily used in the production of refrigerants, plastics and other chemicals. A small amount is also used in industries such as fats, oils, greases, rubber, waxes, resins, floor polishes, gums and adhesives as a solvent may also be exposed to it. Other uses are as a dry cleaning agent to remove spots, as a fumigant and in fire extinguishers to lower the freezing temperature of carbon tetrachloride. Exposure to chloroform occurs mainly through breathing or skin contact. Exposure to the vapour can irritate the eyes, nose and throat. Lower concentrations of chloroform can cause dizziness, fatigue, light-headedness, nausea, confusion and headaches. Higher levels may induce anaesthesia with changes in respiratory rate, cardiac effects (e.g. irregular heart beats), gastrointestinal effects (e.g. nausea and vomiting) and effects on the liver and kidneys. Exposure to very high levels can result in death. A fatal oral dose of chloroform may be as low as 10 ml (14.8 g) with death due to respiratory or cardiac arrest. Breathing chloroform or ingesting chloroform over long periods of time may damage the liver (such as hepatitis and jaundice), kidneys, skin and central nervous system (such as depression and irritability). Skin contact with the liquid can cause a rash or a burning feeling. Repeated skin contact may produce dermatitis. Absorption through intact skin occurs rapidly. The liquid can cause severe eye burns. Chloroform is a probable carcinogen too. Read more about the harmful effects of Chloroform on health and the environment here. Dichloromethane is a colourless, volatile liquid with a moderately sweet aroma. It is widely used as a solvent, in paint removers and as an aerosol propellant. It is used in metal cleaning, as a solvent in the production of polycarbonate resins, in film processing, and in ink formulations. Dichloromethane is metabolised by the body to carbon monoxide potentially leading to carbon monoxide poisoning. Prolonged skin contact can result in the dichloromethane dissolving some of the fatty tissues in the skin, resulting in skin irritation or chemical burns. Exposure to high concentrations may cause unconsciousness and death. Exposure may irritate the lungs, which can cause a build-up of fluid (pulmonary oedema). Long term exposures at high levels may damage the liver and brain. Dimethylformamide is primarily used as an industrial solvent. Dimethylformamide solutions are used to process polymer fibres, films, and surface coatings. Short term exposure may cause damage to the liver while longer term exposure causes nausea, vomiting, jaundice, alcohol intolerance and rashes. Ethyl acetate is used as a solvent for varnishes, lacquers, dry cleaning, stains, fats and nitrocellulose. It is released during the production of artificial silk and leather, and during the preparation of photographic films and plates. It is released during the manufacture of linoleum, and ‘plastic’ wood, dyes, pharmaceuticals, drug intermediates, acetic acid, artificial fruit flavourings and essences, perfumes and fragrances. Ethyl acetate is also present in wines. Ethyl acetate is fairly nontoxic. However, one study showed that exposure to significantly high levels of ethyl acetate may lead to suppression of appetite and hence, body weight. The NPI states that short-term exposure to high levels of ethyl acetate results first in irritation of the eyes, nose and throat, followed by headache, nausea, vomiting, sleepiness, and unconsciousness. Very high concentrations may cause a stupor. Prolonged exposures may cause clouding of the eye, damage to the lungs and heart and kidney and liver problems. The main use of hexane is as a solvent to extract edible oils from seed and vegetable crops such as soybeans, peanuts or corn. Commercial grades of hexane are used as solvents for glues (rubber cement, adhesives), varnishes, and inks. Workers in the printing industry may be exposed to hexane where it is used as a cleaning agent. Short-term inhalation exposure to high levels of hexane causes mild central nervous system (CNS) effects, including dizziness, giddiness, slight nausea, and headache. Chronic exposure to hexane in air is associated with numbness in the extremities, muscular weakness, blurred vision, headache, and fatigue observed. Methanol, is the simplest alcohol, and is a light, volatile, colourless, flammable, poisonous liquid with a distinctive odour that is somewhat milder and sweeter than ethanol (ethyl alcohol). Methanol is primarily used as an industrial solvent for inks, resins, adhesives, and dyes. It is present in fuels as a petrol additive and as a solvent in a number of insecticide and fungicide formulations. Methanol is used in antifreeze or in paint strippers, aerosol and non-aerosol spray paints, some glass cleaners and as a fuel for picnic stoves and soldering torches. Exposure to methanol may cause irritation of the eyes, nose, mouth and throat. It can lead to liver damage, cause headaches, cardiac depression, nausea, vomiting, blurred vision, optic nerve damage, dizziness and a feeling of intoxication. Methanol exposure may lead to severe abdominal, leg and back pain. Methanol is harmful by ingestion, inhalation or through skin absorption. Repeated contact can dry the skin, resulting in the skin cracking, peeling and itching. Methanol can cause temporary or permanent blindness when inhaled, ingested or passed through the skin. Exposure to high concentrations can cause coma or death.